arrow_forward How to use the EmailBuilder in Mailify Sunrise ? arrow_forward What are the different types of emailing campaigns? arrow_forward How can I share my email campaign and give it tags? arrow_forward How can I import contacts for my email campaign? arrow_forward How to use the Mailify Sunrise image editor? arrow_forward How to manage, sort and analyze the recipients of an email campaign? arrow_forward What are the different ways of creating an email campaign? arrow_forward How to perform an A/B test with Mailify Sunrise? arrow_forward How do I define an unsubscription list (blacklist)? 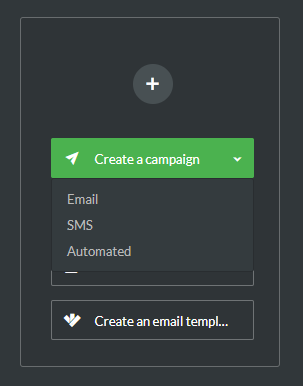 arrow_forward How to setup the emailing campaign header? arrow_forward How to add an attachment to your email campaign? arrow_forward How to create my email with Mailify Sunrise? arrow_forward How to configure the hosting of the images in my emailing campaign? arrow_forward How to insert dynamic custom fields in my emailing campaign? arrow_forward How to insert and customize a "mailto" link in my emailing? arrow_forward How to disable Mailify's signature on the footer of my emailing? arrow_forward How to insert an animated GIF in an emailing? arrow_forward How to test and send my emailing campaign? arrow_forward What is predictive sending? arrow_forward What is interval-based sending? arrow_forward How many credits will I be charged for my email campaign? arrow_forward Can I import and customize my own fonts? arrow_forward How to insert a link to unsubscribe via the standard HTML editor? In order to send email campaigns, it is necessary to have email credits. If you do not have any credits, you will still be able to create a campaign but you will not be able to send it. You can view your credit balance from the Mailify Sunrise dashboard. If you do not have credits yet, you can buy them by clicking directly on the "order" button next to your credit balance on your dashboard, or from the settings of your account, in the "Account" section and then in the "Offer" menu. Your credits will be made available instantly after your purchase and you will be able to start sending emails directly. To start creating an email campaign, go to your Dashboard and click on the drop-down menu "Create a campaign" then "Email".